This covered van is a Great Western Railway Fruit C with the number 2862. It was built in 1938 to Diagram Y.9,Lot 1634c This Fruit C was at the Didcot Railway Centre. Didcot had painted this wagon, but had not yet repainted the numbers in 2008. 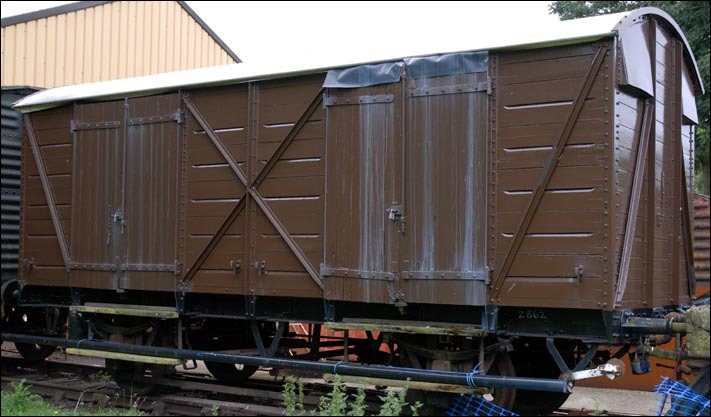 This Fruit C covered van is one of around 50 railway wagons most of which were built by the great Western Railway or the British Railways Western Region that have been saved at the Didcot Railway Centre that is next to the Didcot mainline railway station.